Want to know why the Volvo S60 Dynamic is a popular compact luxury sedan? Look closely at these trim features and you'll understand why. The reason you can easily recognize the Volvo S60 on a crowded highway is due in part to the Active Dual Xenon headlights. These headlights work to give the vehicle a unique appearance that allows other drivers to spot the car even in the worst weather conditions. Even in the worst weather, as the driver, you'll have no trouble seeing far ahead of the vehicle. The interior of the Volvo S60 is comprised of milled aluminum inlays that grab your attention. Bright metal pattern give the car's interior a three-dimensional look, while the satin finish helps to make the patterns throughout stand out more no matter where you look. 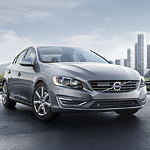 The Volvo S60 is here at Volvo Cars Hilton Head for you to take out for a complete test drive today.